Medium post by Chris Berg, Sinclair Davidson and Jason Potts. For more than three decades economists and cryptographers have been working on the same problem. Neither species has recognised their own work in the other. But it turns out that the question of how to coordinate a society and how to ensure communication can be trusted is the same question differently phrased. Our argument in this essay is simple: What cryptographers call byzantine fault tolerance and economists call robust political economy is the same thing. This observation turns out to have some significant consequences for understanding the history of economic thought and the directions of institutional cryptoeconomics. But to explain why, let’s quickly revisit one of the most important debates in the history of economics. Economists from Adam Smith on have sought to explain the wealth of nations — why some nations are prosperous and others are not. By the twentieth century this debate had coalesced into a debate about which of two economic systems (communist central planning or capitalist decentralised markets) were more likely to bring prosperity. Smith argued that market societies were characterised by spontaneous orders. Social order came from market incentives. Karl Marx objected that the state (or some central coordinating authority) could produce superior outcomes to the market through conscious, deliberate planning. In 1920 the Austrian economist Ludwig von Mises published Economic Calculation in the Socialist Commonwealth. In this essay, Mises made a new, fundamental critique of socialist planning — the problem of information. In a market economy, Mises argued, prices constitute signals about the highest value use of a good or service, providing a guide for what goods were in demand, and which were in a glut. How would [a socialist planner] decide whether to send rubber to Tyre Factory 12 or Hose Factory 7? In a market economy, the factory that needed the rubber most would be willing to pay the highest price. But there is no natural price system in socialism — consumer prices are decided by the planner, and rubber allocated according to their diktat. Mises’ critique of socialism was extended and elaborated by Lionel Robbins and Friedrich Hayek. Hayek turned this argument into one of the greatest essays in economics: ‘The Use of Knowledge in Society’, where he described prices as a decentralised knowledge network. The Mises and Hayek argument today is well known, particularly after they seemed to be proven right by the fall of the Berlin Wall. By contrast, their opponents in the debate are less read today. Mises and Hayek’s criticism was answered by the Polish economist Oskar Lange and extended by Hayek’s Russian-born student Abba Lerner. Lange and Lerner accepted the importance of the price system in organising economic activity. But they argued that this system could be simulated mathematically. Working firmly in the equilibrium economics school Vilfredo Pareto and Léon Walras, they imagined the price system as computational machine. In On the Economic Theory of Socialism, published first in 1936 and 1937, Lange concluded that a socialist economy could simulate the effect of the price system by trial and error. My answer to Hayek and Robbins would be: so what’s the trouble? Let us put the simultaneous equations on an electronic computer and we shall obtain the solution in less than a second. The market process with its cumbersome tâtonnements appears old-fashioned. Indeed, it may be considered as a computing device of the pre-electronic age. Not only could computers simulate the market but the computer could conduct long range planning and implement that plan — “a function which the market never was able to perform”. How decentralised is Hayek’s market, really? It is typical to cast these two visions of the economy as Lange’s centralised planned economy and Hayek’s decentralised market. But Hayekian decentralisation still has a lot of centralisation in it. Here the Marxists are right. Free markets have an awful lot of state involvement in them. Property is private but its enforcement relies heavily on public authorities — the legal system courts, sheriffs, police. But what both the Hayekians and the Marxists missed is that property rights are not only about enforcement. They’re about the identification and verification of property rights. And (right now) the state does most of that. As we argued in our previous essay, so much of what the modern state does is endorse, manage, and verify ledgers of social relations. The state manages the property titles register. It manages ledgers of social security entitlements. It manages the ledgers of who is a citizen and who can therefore participate in political bargaining. This is a very big, important, and largely unappreciated function that the state fulfills. The state does is in charge of these crucial ledgers because it is a large ‘trusted’ entity. But of course how much we can trust the state is questionable. The invention of the blockchain presents us with new institutional choices. 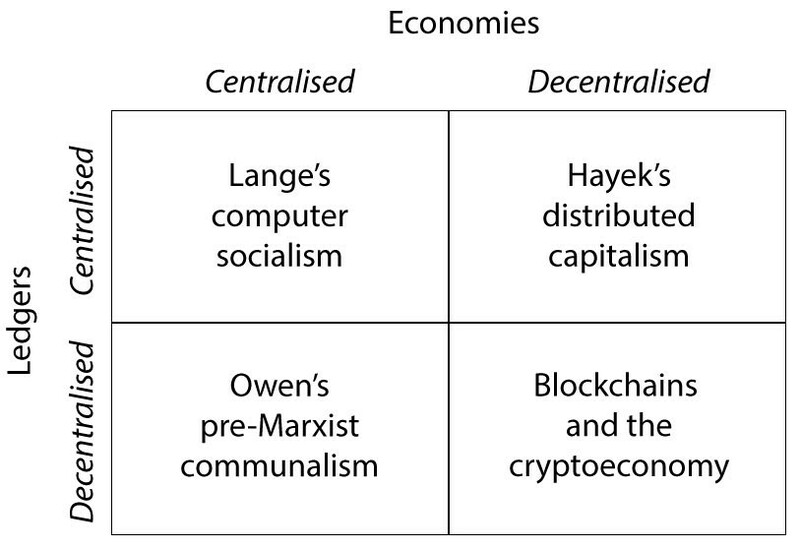 In our new typology of political economy, political ideas are arranged in a grid of centralised and decentralised economies, and decentralised and decentralised ledgers. In Lange’s computer socialism, the economy is centralised and the ledger is centralised — the state is a planning machine, both managing the ledger and executing a global plan. In pre-Marxist communalism, such as the scheme devised by the Welsh utopian socialist Robert Owen, economic planning is centralised but the relevant jurisdiction — that is, the ledger-providing authority — consists of subnational groups of voluntary, socialistic communities. Hayekian distributed capitalism has a decentralised economy — planning is done by individuals rather than the state — yet the state still organises, records, verifies and updates the ledgers of identities, rights, obligations, and entitlements. By contrast, in a cryptoeconomy both the economy and the ledgers are decentralised. Blockchains take the state out of both planning and verification. Markets work because they align incentives into productive work and they harness distributed information productively. In the second half of the twentieth century the public choice school extended the incentives critique to encompass the incentives of the planners themselves. How could a socialist commonwealth ensure that planners worked in society’s interest, rather than their own personal interest? Today, what scholars now call a ‘robust political economy’ (see Mark Pennington’s book and this paper by Peter T. Leeson and J. Robert Subrick) is an economic system structured to deal with the twin problems of information and incentives. How can we coordinate action — make exchanges, build relationships and communities — in a world of incomplete information and potential rentseeking? Turns out, cryptographers and computer scientists have been working on these two problems as well. Distributed computing systems have to deal with what is known as the Byzantine Generals’ Problem. This problem was first expressed in 1982. 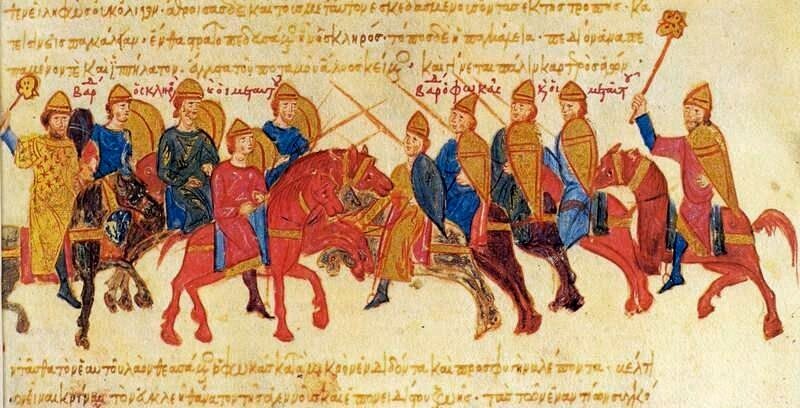 Imagine a Byzantine army surrounding an enemy city. The army consists of divisions, each headed up by a general, and they need to establish a consensus about when exactly to launch their attack on the city. Centralised command is out of the question. No individual general has line of sight to all the generals — or the authority to impose consensus on the whole army at once. They can only communicate by messenger. So there’s an information problem. The generals need a system — an algorithm — that allows all generals to agree on a consensus. The problem is made even harder because it’s not certain that all generals are loyal. Some have been paid off by the enemy, and are actively trying to disrupt the plan. The traitorous generals don’t want the loyal generals to come to a consensus. Thus Byzantine Generals’ Problem describes the challenge of a) achieving consensus in distributed, decentralised systems b) when information flows imperfectly, and c) in the presence of adversaries. Blockchains achieve Byzantine fault tolerance in part by treating it as an incentive problem. The Bitcoin proof-of-work mechanism incentivises good behaviour, makes it extremely expensive to attack the network, and reduces the payoffs for a successful attack. A decision to attack a city simultaneously is just a narrow slice of the general economic problem: how to coordinate activity in when information is incomplete, communication is imperfect, and people can be lazy, opportunistic, and self-interested. What computer scientists have been trying to solve algorithmically, economists have been trying to solve constitutionally. Where cryptographers have found their solutions in public key cryptography and proof of work mechanisms, economists have found solutions in markets, regulation, and institutions. Blockchains bring these two fields together. They turn constitutional questions into algorithmic questions, and algorithmic questions into constitutional ones. One way to see this is as a curious historical instance of two largely unrelated fields (computer science and economics) somewhat simultaneously working on a structurally similar problem (decentralised coordination) and arriving at the same type of solutions (consensus protocols and market institutions). But a more interesting perspective is that blockchain technology actually joins these worlds together in reality. Blockchains can provide the secure fault tolerant decentralised layer for property rights information and its verification and updating whenever that information changes, which can support a decentralised economic layer of markets. The socialists were wrong in their hopeful quest that (centralised) computers would replace markets. Actually, it is decentralised computers (blockchains) than can replace governments. Markets always need governance, and the limits of a market society were always the ability of the state to provide those services of record keeping, validation and verification of transactions in property rights. In return, the state levied taxation to fund these services. Blockchains are a new technology of fault tolerant governance that can furnish the governance to underpin a market economy and society. We call this Byzantine Political Economy.